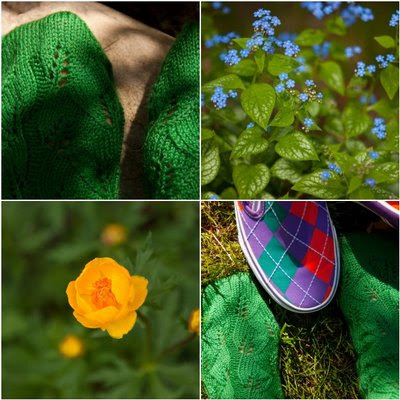 Certain knits seem to go on for ever....this was definitely the case with my green socks. I started them with much anticipation on St. Patrick's day because green socks seemed like an appropriate project. However, since then these socks have languished about, adding much guilt to my day because I was ignoring them. When I picked them up again I pondered the real fact that I was never going to wear these...ever...not even on St. Patrick's day. They are too green. The pattern, on the other hand, is quite beautiful and I would knit these again in a different color and a different yarn. The Gems was not my favorite yarn to work with.